CM of Punjab Sh. Prakash Singh Badal said that non-availability of residential houses is a political issue in which private sector plays a significant role. During the inauguration of Ganpati Enclave, a colony introduced by Mittal Group at Bathinda, on Dabwali road which is in an area of 60 acres and in which multi floor and other distinct size houses are available, he said that state govt will motivate these types of initiatives. He said in coming 5 years Bathinda will be the most developed city not only in Punjab but in India. He said flyovers will be made on all railway tracks. He said the inauguration ceremony of cricket stadium was canceled due to death of Sh. Balraj Singh Bhundar son of a senior leader of the party s. Balwinder Singh Bhunder and it will be rescheduled in next month I.e. first week of November. 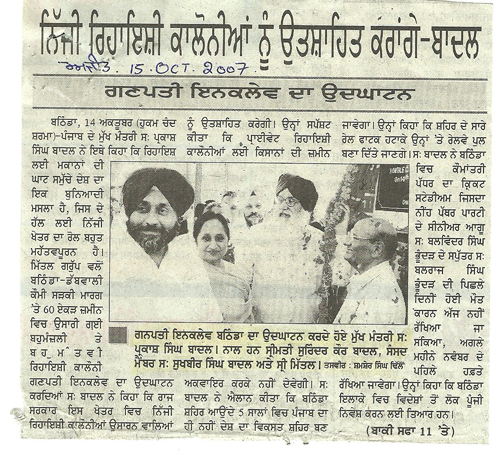 He said foreigner’s r ready to invest in Bathinda.